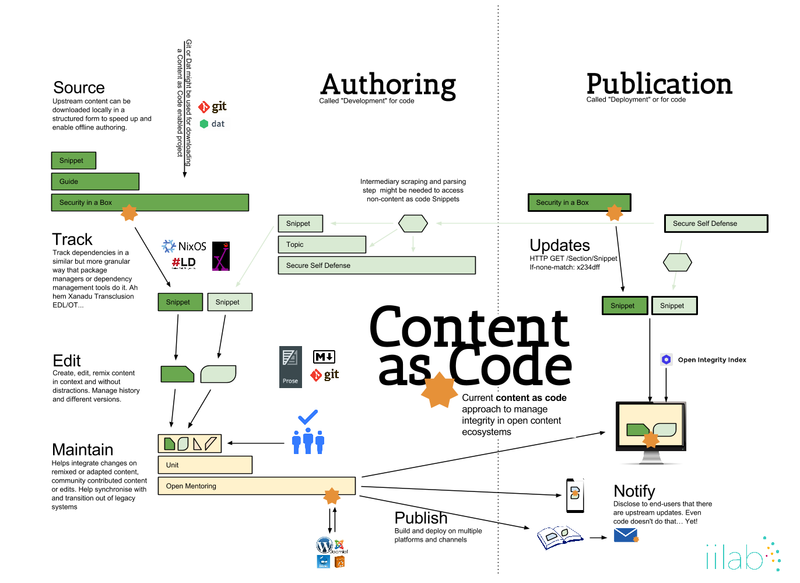 Content as Code · Developing workflows and technology to improve content re-use and maintainability. Developing workflows and technology to improve content re-use and maintainability. Content as Code is an approach to develop workflows and technology to improve content re-use and maintainability. It aims to make content authoring and management benefit from software engineering collaboration best practices. Support dependency tracking at the fragment level. Support a micro-service approach to providing commenting, statistics and other dynamic features. Content as code is supported by a partnership. The partnership brings together implementers contributing to projects publishing free/libre and open source content and wanting to have a lightweight (post-CMS or CMS-Free) approach to content management that focus on the author experience (as well as editor and translator experience).